According to the Infidelity Recovery Institute, research has shown it takes roughly 18 months to recover from infidelity. Of course, all couples are different and in order to truly recover from an affair, a couple must put in a significant amount of work. Some might think it takes a lot of work on the part of the betraying partner, but the truth is, both people have to help recover from an affair. First, what does “recover” actually mean? We often hear people say they want things to go back to “the way things were” but in recovery, couples need to strive for a new normal that is better than the way things were. Affairs are typically (but not always) a symptom of underlying relationship issues and returning to the way things were will not heal those underlying issues. While it is possible to return to a previous relationship state, it is not sustainable long term. Most marriages either grow or end from affairs. Recovery in the instance of an affair, means to heal, grown and find a new normal (the goal being an even better one). Below are a few simple ways to navigate the darkness while searching for the light and the hope of a new life and marriage. Often couples try to resolve things on their own and walk into therapy more damaged than they were immediately following the affair. We recommend seeking therapy as soon as you discover the affair. A therapist can help you establish boundaries to keep your relationship safe – ending the affair, rules about disclosure and transparency. A professional can also help you process what’s happened, learn why it happened in the first place, start healing and rebuilding trust. 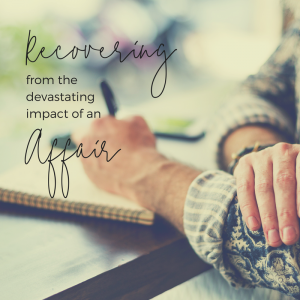 There are 5 stages to healing after an affair – Discovery, Grieving, Acceptance, Reconnection and Maintenance. Even if you commit to working on healing and repairing your relationship as soon as the affair is discovered, the process is difficult and healing will not occur overnight. Be patient and kind with yourself and your partner. Each person has their own struggles. Do your best to understand and empathize with your partner. One of the best ways you can help yourself is to practice self-care. It’s common to put it aside and be overwhelmed with whatever we are feeling. If you’re feeling really off or down, consider getting a physical including bloodwork and an assessment for mood issues such as depression or anxiety. It is important to eat healthy and get plenty of rest even when it feels difficult to do so. Make sure you are getting adequate exercise and fresh air. Think about some of the things you like to do – maybe yoga, talking with friends, playing with your kids or pets, getting outdoors, reading or writing and arts. These are all great coping skills that can help you self-soothe in times of stress. This can include journaling, having an accountability person or more to share difficult feelings and emotions with and seeking therapy. Allow yourself to feel the feelings you are experiencing without being judgmental or critical. There is no right or wrong way to feel. Both partners often feel isolated and alone in the aftermath of an affair – counseling and support groups can be really helpful during this painful time. The road to recovery and healing is a long one – it’s often a place and time where couples feel lost and confused. Most people struggle to put words to the endless thoughts and feelings they have and often report feeling crazy. It’s okay to feel this way. It is a normal part of the healing process. Seek the help of a professional during this difficult time. A therapist can help you understand what’s happening, put your feelings and thoughts into words and identify what you want and need moving forward. Our therapists are specially trained to assist couples in healing from affairs. We also offer one of Jacksonville’s only affair recovery groups. Learn more information about our affair recovery groups for unfaithful partners and betrayed partners, or, schedule an individual or couples therapy appointment. We’d love to help you begin your journey of healing and recovery.